We presented two American black bears (Ursus americanus) with a serial list learning memory task, and one of the bears with a matching-to-sample task. 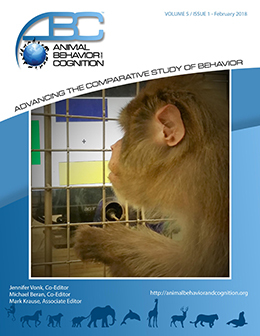 After extended training, both bears demonstrated some success with the memory task but failed to generalize the overarching rule of the task to novel stimuli. Matching to sample proved even more difficult for our bear to learn. We conclude that, despite previous success in training bears to respond to natural categories, quantity discriminations, and other related tasks, that bears may possess a cognitive limitation with regards to learning abstract rules. Future tests using different procedures are necessary to determine whether this is a limit of bears’ cognitive capacities, or a limitation of the current tasks as presented. Future tests should present a larger number of varying stimuli. Ideally, bears of various species should be tested on these tasks to demonstrate species as well as individual differences.